THEY SAID HE couldn’t do it. They said he wouldn’t win. They seemed to be everywhere: pessimists and naysayers in newspapers, in sports magazines and on the Internet. Sure, he was an impressive three-year-old horse, this American Pharoah who first became famous for having a misspelled name and a chewed-off tail. But no way would he be a Triple Crown winner, winning three races in five weeks—the Kentucky Derby, the Preakness, the Belmont Stakes. The reasons were longer than a chore list. • So what if he does have the great Secretariat in his bloodline? His mother was a sprinter. He doesn’t have what it takes to go a mile and a half in the Belmont. • Look at his times! His final quarter mile in his Kentucky Derby win was a crawling 26.57 seconds. That’s like a kiddie car on a freeway. • Other greats—Seattle Slew, Citation, Count Fleet—those Triple Crown winners were old-timey Thoroughbreds, bred to be heartier, stronger, tougher. This kid, Pharoah, will be toast. • Today, no horse can handle that schedule—win the Kentucky Derby, then two weeks later, the Preakness, and after only a three-week rest, win the longest race of them all, the Belmont, with its grueling one and a half miles. The first two take too much out of them; they need recovery time. • If a truly great horse, Spectacular Bid, couldn’t get it done in 1979, don’t expect any horse to secure American horse racing’s most coveted sweep. After all, in his career, Spectacular Bid ran thirty races and won twenty-six, and one of his only losses was the Belmont. 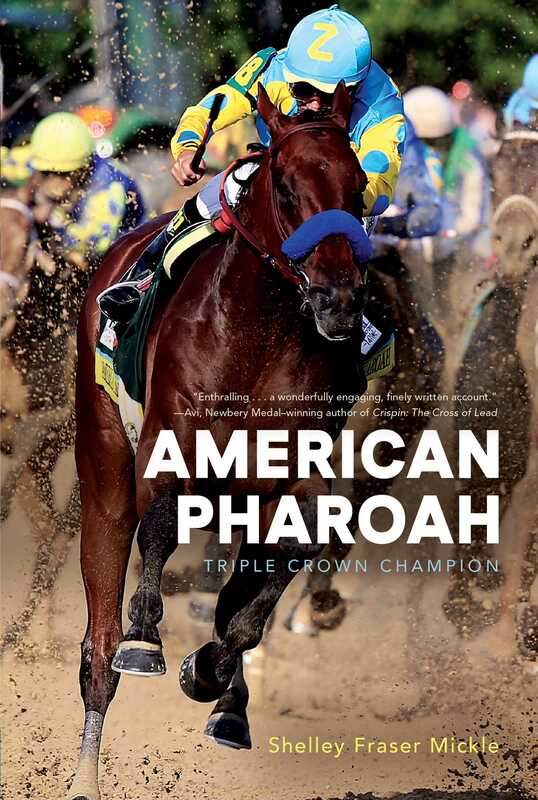 The Triple Crown is the hardest prize to win in all American sports. It hasn’t been done in thirty-seven years. Sorry, Pharoah, nice try, but you’re running against history. • If he doesn’t draw a good post position for tactical advantage, it’s, So long, Pharoah, it was nice to know ya. • The best recipe for a Triple Crown is a truly great horse in a weak year. American Pharoah might be a great horse, but this is not a weak year. Even a scientific study before the Belmont showed why American Pharoah would not win. It cited glycogen levels used up during intense exercise. It pointed out that the muscle power used in his wins in the Kentucky Derby and Preakness would not have had time to repair. And then there was the point about the wear and tear on a Thoroughbred’s skeleton. Poor Pharoah. He was called a loser before he even began. Only eleven horses had won the Triple Crown. Yet in the midst of this time when It can’t be done was a cool thing to say, a dark brown horse walked into the starting gate to change America’s mind. Some would never want to admit that they needed this: to behold a breathing half-wild creature with a heart born of willingness to burst through history. In this time when meanness, bullying, shooting down dreams, and worrying about the world rose from frustration and confusion to look smart in agreeing to nothing, something was about to happen. It was the sort of thing that appears only once in a great while—as when Mozart sat down at a piano or Michelangelo put his brush to the ceiling at the Sistine Chapel and his sculpting tool to a hunk of stone. A miracle was about to happen. That is, for those who took the time to look. Victor Espinoza, five foot two, worn from his forty-three years of outrunning poverty, hunkered in the saddle on the back of American Pharoah in the starting gate and heard his stomach growl. Today he had already ridden a handful of races, and now he was about to take off in the big one. The Big one, the Belmont for the Triple Crown. “Don’t think of it; you might jinx yourself,” he silently coached himself. But boy, was he hungry! Usually he had two rituals on race day: to take a nap and to pray. He prayed for safety and health. He napped to conserve energy. But today he’d had no time for a nap. Yet how much good would a nap really do? Excitement about the chance to win the Triple Crown would have peppered his z’s. Besides, he’d been here twice before. And each time, winning had eluded him. When he talked to himself, he often used Spanish, the language he had grown up with. Born in the town of Tulancingo in the state of Hidalgo, Mexico, on May 23, 1972, one of twelve children, he was now surprised to be the oldest jockey in this race. For someone who grew up taking care of goats—leading them up a mountain before school so they could eat all day, then going all the way up again to bring them back before supper—he’d learned long ago never to have dreams. Dreams could break your heart. But goals—now, having goals was a different matter. And here he was, fulfilling one of his highest: riding in the Belmont, going for the Triple Crown for the third time. Most never even got a first chance. Besides, this time felt a bit different. In the year that he and American Pharoah had been a team, he had not yet asked the big bay colt for his highest gear, his greatest speed. No one really knew what the colt was capable of. Even more unusual than his blazing speed was the colt’s temperament. Often young racehorse stallions are so aggressive that being around them requires handlers to watch out for their fingers and toes. Aggressive young horses can bite as quickly as a rattlesnake strike. They can whirl about at the drop of a leaf to land on someone’s toes. While Pharoah could be aggressive around other horses and as nervous as a feral barn cat—especially since he was sensitive to the noise of a crowd—Victor had found that Pharoah was also so gentle and trusting that the young horse could actually fall asleep in his arms. And here Victor was about to ask this kind creature to put away a field of seven aggressive three-year-old Thoroughbreds and stomp open the pages of racehorse history. In the starting gate, post position five, American Pharoah shifted his feet as usual—right, left, and then back. The big bay horse didn’t know that a trophy waited at the end of the track. He didn’t know what money was. He didn’t know about a human’s hunt for glory. Even if he had known, he wouldn’t have cared. He simply had to trust and obey the human on his back, who was only necessary as the supporting player to release what was never quenched: the urge to run, to run. It didn’t even matter where. The challenge now was to wait. Three more horses had to load for this total field of eight. A big Thoroughbred named Frammento was in the starting gate on his left. Now on his right, the impressive gray, Frosted, was led in, followed by the click of the gate tucking him in. Thank goodness for the earplugs to snuff out most of the noise; otherwise Pharoah was likely to go bonkers now. After his first race, it had been discovered that he was supersensitive to sound, which could set off an anxiety that would use him up. So always now, he wore earplugs. The seats were all sold out. The crowd had been limited to ninety thousand. Most of those were now on tiptoe, their sense of excitement passing from one to the other in a heightening roar. Not many in the crowd—along with some twenty million others watching on television—really expected to see a winner break the long Triple Crown dry spell. Three decades of seeing twelve horses qualify for the Crown by winning both the Kentucky Derby and Preakness but fail to win the Belmont had tempered racehorse fans’ expectations. In 2012 a horse ironically named I’ll Have Another could have made the elite list of contenders thirteen, but he had been scratched from the Belmont with an injury. Yet, despite the dry spell of having no Triple Crown winner since 1978 with Affirmed, and the year before with Seattle Slew, those who were there quietly held on to the possibility of seeing something breathtakingly spectacular. In the back of everyone’s mind was the fervent hope to see a win like that of Secretariat in 1973. That was the year the big chestnut put away a field of contenders by a freakish thirty-one lengths. While claiming the Triple Crown trophy and a blanket of carnations in stunning glory, Secretariat also set a track record. Yes, it was always fun to be at the Belmont Stakes for the excitement of the famous race. And, of course, for the party. Victor was thinking about the one-eighth pole. He knew that when he and Pharoah got there, he could sense how much Pharoah had left—how much strength, how much desire, how much fight to take over the lead of this small herd as if he were living out his fantasy of running wild on a far-off prairie. That desire thrived deep in the colt’s instinctual memory. What would set it loose could be a matter of Victor’s riding, positioning the colt to receive a silent signal sent between rivals. It could be the threat from one young stallion to another, sending the message, Don’t you dare pass, which was the standard challenge of one alpha horse to another. If Victor could coach Pharoah into that long, smooth-as-silk cruising speed and keep a lookout for who was coming up behind, he could take note of how Pharoah was breathing. In his jockey’s stance, his ankles would be in contact with the colt’s big chest, and through his boots he would feel Pharoah’s heartbeat. That would tell him the colt’s stamina. Then Pharoah could send back his signals of, I got this, Coach. No sweat. This herd is mine! Through the six races they had already won together, the language they had built between them became like two musicians blending the notes of their separate training. Pharoah’s trainers had taught him to rate, to use his speed in response to the shift of the jockey’s body and the grip on the reins. Rating his speed saved his stamina for the homestretch and was also essential to carrying out a race strategy. Maneuvering among the field for the final turn to the finish line could be tricky. It always required that a horse listen and obey its jockey. Through their first few races, Victor had learned to read Pharoah’s silent language—an instant message sent through a twitch of the young horse’s ears, through a tenseness of muscle. Hundreds of small unconscious readings were now being taken in by both man and horse. They were two athletes on countdown, primed for blastoff. The last post position was filled, and the gate clicked behind Materiality, the horse many believed would steal the race. They’d met up once before—Pharoah and this son of Afleet Alex, the horse who in 2005 had stumbled to his knees in the stretch of the Preakness and won anyway. Then he’d even gone on to win the Belmont. A tough, tough horse! What if his son had inherited that burning desire to overcome anything, and used that grit today? Clearly, there was stellar competition for Pharoah. Victor concentrated; Pharoah read Victor’s body tensing, and like a good dance partner, the colt coiled himself in response, leaning a little against the back gate. Oh no! The trainer had told Victor to put Pharoah on the lead, to get out front at the start and stay there. Mess up the break from the gate, and they would both be a dot in history. The starting bell sounded with a harsh burr, and the gates swung open. As American Pharoah leaped out, he was a step behind the others due to leaning against the back gate, and his pace was a little slow. Victor urged him to understand that getting out front now was the most important thing in the world. As if frozen in flight, Pharoah stretched out, his hooves seeming to barely skim the track. Suspended in air, he began his next stride. At the one-eighth pole, Victor took note: yes, Pharoah was breathing like a happy, well-stocked steam engine. Underneath his left boot, he felt Pharoah’s heartbeat. It was pumping in a fine rhythm—a strong, robust two-beat thump. The trick now was to conserve that strength, to know where everyone else on the track was, and not to ask Pharoah for more speed until, until . . .
Around them, hoof-thunder rose in a roar: a sound as awe-inspiring as any on earth. Even the ground itself seemed to tremble in the onrush of so much power. In the midst of it all, Victor was smiling. American Pharoah certainly seemed ready to shake history in his teeth, pry it open, and sail through. To win a Triple Crown, a young three-year-old Thoroughbred must win three races in a grueling schedule of only five weeks. The first race is the Kentucky Derby, on the first Saturday in May in Louisville, Kentucky. It is limited to a field of twenty horses to run for a mile and a quarter, and all those twenty have to earn points to enter, which means that only the best three-year-olds of that year are running. Two weeks later is the Preakness Stakes in Baltimore, Maryland, for a distance of a mile and three-sixteenths. Even though that distance is shorter than the Derby—and the field is usually small—those running are again the best of the three-year-olds, fit and ready to race. If a horse is victorious in both of those legs of the Triple Crown, then three weeks later that horse faces the longest race of all, the Belmont Stakes, a mile and a half. The order of these races has been the same since 1931. No wonder the Belmont, this last jewel in the Triple Crown races, has been nicknamed “The Test of the Champion.” Inaugurated in 1867, the first Belmont Stakes was held in the Bronx, one of the five boroughs of New York City. It was named after horse-racing enthusiast August Belmont Sr., who financed the first race. In 1905 it was moved to a new 430-acre racetrack in Elmont, New York, on Long Island just outside New York City. The race is held on the first Saturday that falls on or after June 5. The winning horse is draped with a blanket of white carnations after the race, similar to the tradition of the Kentucky Derby winner being draped in roses and the Preakness winner being draped in black-eyed Susans. In the winner’s circle, the owner of the winning horse is given a silver trophy designed by the famous Tiffany & Co. in New York City. This trophy was first presented to August Belmont Sr. in 1869 and was donated by the Belmont family for each year’s presentation since 1926. At its mile-and-a-half-length on a dirt track, the Belmont is open to only three-year-old Thoroughbreds, either colts, geldings, or fillies—though it is rare for a filly to be entered in a race against male horses. The word colt describes a male horse under the age of three. When a colt turns three, he is then considered to be a stallion, though racehorse people tend to say “three-year-old colt.” A gelding is a male horse that has been fixed so as not to breed. Fillies are female horses until they are three, when they are called mares. In general, colts and geldings are stronger and more mature than fillies at the beginning of their race careers. Colts and geldings in the Triple Crown races carry 126 pounds; fillies carry 121 pounds. The term graded stakes race means any Thoroughbred horse race in the United States or Canada that requires an entry fee that owners must pay. The term has been used since 1973 by the Thoroughbred Owners and Breeders Association, which also grades the stakes into three levels, I, II, and III, always using roman numerals to identify them. The fees to enter, added to an additional amount from the racetrack, make up the prize money paid to first-, second-, third-, and fourth-place finishers. All of the Triple Crown races are Grade I stakes. By 1935, when the Thoroughbred Omaha won the three races, more writers picked up the term in describing that horse’s accomplishment. Two years later when War Admiral won all three races, the term Triple Crown was everywhere. On the rare occasion that a horse has won all three races, the Triple Crown trophy—a silver vase first awarded to winner Citation in 1948—is presented in the winner’s circle at the Belmont. 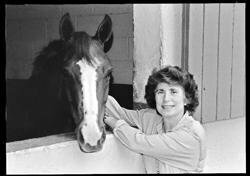 Winning the Triple Crown is indeed an extraordinary feat for a young Thoroughbred.